Be nice…to everyone As weird and ridiculous as this sounds to me now, I used to be very afraid to be nice to people. I mean, it's high school, it's cliquish, I get that, but when you get out of high school and look back, you will see just how irrelevant all of that really was. Say "Hi" to people in the hallways, ask people how their classes/days are going and actually genuinely care about the answer, talk to people who you aren't necessarily friends with, just because you never know how much that can make their day, and it sounds cliche, but it will really make yours too. I stuck to such a rigid group of friends in high school, and while I had fun and enjoyed my 4 years, I can't imagine how different it would have been if I was a more approachable person. Join in/Attend as many things as you possibly can (and document it) I went to lots of things in high school, but by my senior year I started to take things for granted and stopped going to every little thing. Now that I'm done, I really wish I hadn't. I also really wish I had more pictures with everyone at all of the little events that we went to, because my photo albums are seriously lacking. Don't sweat the small stuff, enjoy it I used to get so worked up about each individual grade and assignment, that I sometimes missed out on the other small things, like the awesomeness of getting to eat lunch with your best friends everyday or getting to do cool things like experiments and field trips. As much as I hated hearing it in high school, while your ACT and GPA are important when applying to colleges, once you get in, absolutely no one cares. The things you'll remember once you're out are the funny conversations had at pep rallys or the times spent hanging out at the lockers before class…make sure to be present for them. Stay OUT of the drama I get it. I was once called "Blair Waldorf of the South" and it was practically the greatest compliment ever, but it's really not worth it. You will actually look much cooler and more mature if you just move on from the drama of the day and act like you couldn't care less. Then people will feel like they're being immature and therefore way less cool than you and you never had to say or do anything you'll regret in about a week's time. You really don't want to look back and realize you spent lots of your time not being friends with someone because they made one rude comment or talked to the boy you liked for about a month. Butttt, because I know you will do as you please, follow these three rules : 1. never do your own dirty work, 2. NEVER leave a paper trail in the form of texts, emails, notes, or God forbid mix CDs, 3. never trash talk anyone at school. Say what you will at home behind closed doors, but in the words of Don Corleone himself (The Godfather is the best place for advice really) "Never tell anyone outside of the family what you're thinking." Be who you are…and don't apologize for it. Don't be dumb just because people think it's cool. Be smart, or funny, or wildly punk rock, or prim and proper prep, (or all of those at the same time) or whatever it is you want to be. And don't apologize for it. In my years since high school, I've realized that as I've embraced who I am and left people behind who didn't accept it or who didn't encourage my good traits (or those who encouraged my bad ones), I've been able to find people who are either just like me, or people who accept me for whoever I decide to be. I've also found that those people grow with me, because they don't see me as just one thing, or just one kind of person, we all grow up and change, but the difference is that we do it together, very graciously. So be who you are, even when it's hard, and see who encourages you and pushes you to be even better, and then keep them around forever. Good luck with going back to school, whether it's college or high school or middle school! Enjoy it! P.S. 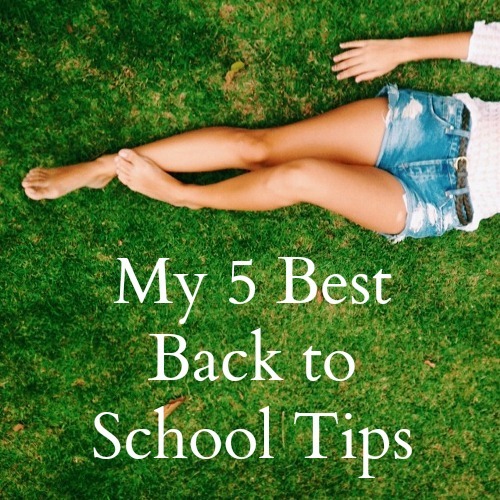 - For college specific advice, check out this blog post for incoming freshman. I love it!